Finally! The first update since 2004. Now much more objective, with more reasonable bigger government options, and some creative options thrown in that you probably haven't heard of. Take the test and see what you think. This is still a work in progress. I have bugs to fix and questions to add. Please email me or leave comments on the blog about any errors, omissions, or suggestions you might have. Have you taken this quiz in the past but forgotten the recommended links and books? You can reach your result page without retaking the quiz by clicking the appropriate link below. You can also see the recommendations given to people who scored differently from you. This is no way to run a country. More nuance is in order. The Enhanced-Precision Political Quiz makes it clear that there is a wide range of possible options for every issue. And the Nolan Chart on which it is based makes it clear that there are at least two ranges of possible opinion overall. At least two. Though the Nolan Chart is a huge improvement over the limited Left-Right spectrum, it is still a projection of a wider space of options. The Quiz herein samples that wider space with creative possibilities outside the usual debates, ranging from more universal military service without a draft to unconditional government money as a replacement for most welfare programs. The result screens reveal yet more possibilities ranging from easy ways to stop global warming to voting systems which allow us to consider more options at the polling place. 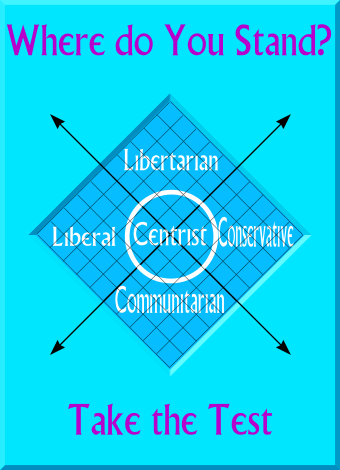 This site now exists not to push any particular party or ideology, but to stimulate creative political thought. If you are an educator teaching social studies, history or political science, have your students take the test and prepare for lively discussion afterwards. Likewise, if you are on a forum and want to uplift your discussions out of parroting the usual talking points, use this quiz as a poll. Finally, if you know of a political party, organization, or think tank which deserves mention in some of the result screens, contact me.